Your Subconscious Mind Holds the Key to Overcoming Addiction to Sugar! Steve G. Jones, Ed.D., Clinical Hypnotherapist, charges $1,500 for a custom recording and $25,000 for a one-hour private hypnotherapy session at his office. But you can get all the benefits for this low price. Simply listen to the Stop Sugar Cravings Hypnosis MP3 every night as you go to bed for three weeks and feel the changes happening in your life. You will feel more empowered, more in touch with your true self, and you will truly know that your goals are within your reach. Steve G. Jones achieves AMAZING and LASTING results!!! Hypnosis is the easiest way to affect change in your life because the positive messages go straight to your subconscious mind effortlessly so you can accomplish your goals and reach for the stars!! All you have to do is listen to the Stop Sugar Cravings Hypnosis MP3 session at night as you go to sleep!!! You’ll hear soft music, the gentle sounds of the beach, and the soothing sound of Steve G. Jones’ voice all working together to bring about positive changes in your life easily and naturally. Steve G. Jones has been helping people improve their lives with hypnosis for over 17 years…now it’s time for him to help YOU… don’t wait, do it NOW !!! you’ll be glad you did. See you at the top! And as you continue relaxing deeper, deeper and more deeply relaxed, I would like you to imagine all of the foods in your life which contain sugar, that’s right, just imagine them all. Imagine them all on a table, all the foods which you have eaten in the past which contain sugar, one form or another, imagine them on a table in front of you. And I wonder how appealing those foods are to you. And whatever level of appeal those foods have for you, let’s just call that a level seven. So imagine those foods on that table, which contain sugar, imagine that your desire for those foods is a level seven. Of course if you have listened to this recording a few times, your level is far below that, but lets just pretend, pretend for a moment that your desire for those foods is at a level seven. And I wonder what it would take for that level to become a six. Maybe they would have sat out on that table for awhile. Maybe the ice cream isn’t as fresh as it could be. Maybe the cake has a few flies around it, not necessarily landing on it, but around it. I wonder now, what it would take to have your desire for those foods to drop down to a level five. What would they then look like? Maybe that ice cream is beginning to decompose a little, showing that it is actually made up of chemicals. Remember the cake? It’s icing is becoming a little dry and cracking. It’s starting to look like mortar; you know the stuff that holds bricks together, something you shouldn’t eat. Maybe there are more flies now. And I wonder what it would take to drop your desire for those foods down even lower. Down to a level six to a level five, down to level four, down from four to three. My goodness. What would those foods look like at a level three? By now, flies have already laid their larvae on some of those foods. As disgusting as it seems, as disgusting as those foods with sugar seem, that’s what has happened. Perhaps they are beginning to smell putrid, those foods with sugar. Sugar itself, the whole concept of sugar is just beginning to sound disgusting to you. Because at a level three, sugar cannot be tolerated. Sugar is offensive and repulsive at a level three. And I wonder what those foods would look like, how they would appear, if your desire for them dropped down to a level two. I think y that those foods, containing sugar and sugar itself, would seem thoroughly disgusting, utterly repulsive. Sugar would be undesirable for you. Now if we dropped that desire down to a level one, sugar would be out of the question. Sugar would be unacceptable in your life and it is unacceptable in your life. And what if we now drop that level down to a zero? The absolute bottom. How would sugar appear to you? You know the answer to this. Sugar would not be acceptable as a food ever again and that is exactly how you view sugar. Sugar is not a food. Sugar is not something you allow in your body, so you avoid it. Congratulations, you have made a very well informed decision to avoid sugar because as you look at that table now and see those foods which formerly, you did enjoy, they reveal their true, disgusting nature. I want you to see them there on the table. Sugar itself and sugar in its various forms as disgusting and repulsive. It is not a food at all. Congratulations for having the ability to see this, to understand that sugar is no longer acceptable in your body. So relax now, relax comfortably and realize that you have made a very powerful decision. You have decided that sugar is no longer acceptable in your body. So relax, relax, relax. It can be difficult to say no to sugar cravings. If you have a sweet tooth, then you probably agree with that statement. Although sugary foods taste good, they do not offer very much nutritional value and they can lead to problems such as tooth decay and can affect your body’s blood-glucose level. If you are trying to overcome your sugar cravings, then I encourage you to first be aware of how much sugar you are eating every day. There are good sugars and there are bad sugars. Good sugars are the naturally occurring sugars in foods such as fruit and honey. Sugars that you should avoid are unnaturally occurring sugars and added sugars. Often times, food that is low in fat is full of sugar to make it taste better. Hypnotherapy enables you to control the amount of sugar you eat. I am sure that at times you feel as if you are out of control when it comes to eating sweets. Hypnotherapy gives back the control to you by re-programming your mind. As shown in the sample of the script above, the Stop Sugar Cravings Hypnosis MP3 recording will program your mind to believe that sweets are disgusting. Within 21 nights of listening to this powerful recording, you will have control over the sweets you put in your body. 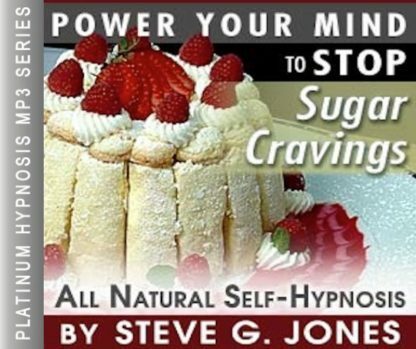 The Stop Sugar Cravings Hypnosis MP3 audio will stop your attraction to sweets. No longer will you feel the need to buy sweets when you are at the grocery store. This includes cake, cookies, candy, and chocolate. Instead, you will feel the need to replace your magnetism to sweets with different foods such as fruit, where sugar is naturally occurring and provides you will extra nutrients. Imagine having the control that hypnosis allows you to have! Eating a lot of sugar is detrimental to your health in many different ways. Sugar effects your teeth, your weight, glucose levels, diabetes, the appearance of your skin, and your energy levels. 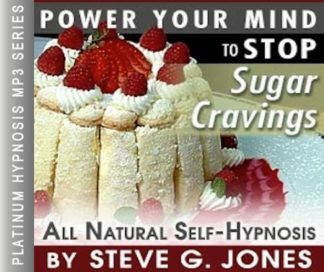 This Stop Sugar Cravings Hypnosis MP3 targets your subconscious mind and you will no longer crave sweets!